Shiraho No. 4 human skeleton with almost full body skeleton remaining, at the Okinawa Prefectural Buried Cultural Property Center, Nishihara, on the afternoon of May 19. On May 19, at the Okinawa Prefectural Buried Cultural Property Center, Nishihara Town, the prefectural education board announced the results of the investigation into the Shiraho Saonetabaru Cave Ruins, which was conducted between fiscal 2012 and 2016. The cave ruins were confirmed as the first graveyard in the old Paleolithic age in Japan. 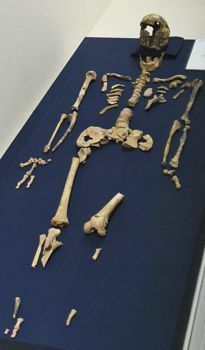 At least 19 pieces of full-body human skeletons from the Old Stone Age were found, which is the largest deposit of its kind in the world. Among the 19 bodies that were excavated, the human bone tagged No. 4 is from about 27,000 years ago (using calibration age), five thousand years older than the Minatogawa Human Bone. There were almost full-body skeletons including skulls, and their posture when they were buried became distinguishable. Regarding the cave ruins previously being judged as a graveyard, the prefectural education board cited the fact that multiple human bones were found in five caves. However, the prefectural education board officials said it is still to be determined how the ruins will be utilized in the future. Ayano Shimabukuro, assistant manager of the municipal board of education and cultural properties section, said, “We want citizens to be able to get close to the valuable ruins.” However, she indicated that there is a problem concerning safety because the ruins are located within the airport. The Neolithic era, during the period when stones were used as the main tools, about 16,000 years ago, is equivalent to the Jomon period in Japan and the Kaizuka period in Okinawa. The dating of the Paleolithic Age has been carried out using the radioactive carbon method, but in recent years, the calibration age verified by the annual rings of plants has also been used to determine the date. The calibration age is about 4,000 years older than the radioactive carbon age, and is closer to the real age.